Beat the egg and sugar together and add the milk and butter. Stir in the soda and cream of tartar into the flour, dry; mix all together, with the flour and salt. Cut into rings and fry in deep fat. Lay them on brown paper when you take them from the fat. This came from a book called Things Mother Used to Make A Collection of Old Time Recipes, Some Nearly One Hundred Years Old and Never Published Before. I think it was printed in 1913 or 1914. I have seen on Pinterest lately that Poke Cakes and Dump Cakes are kind of… trending?? I think the basis of it is because it’s easy. Everybody falls into the… “I don’t have time” category and I understand or at least I did when I was working the 40 hour work weeks and trying to maintain a farm. You know, take a Saturday that you’re at home in the kitchen and make it. It’s a lot of work but it’s so worth it. You’ll feel a complete since of pride. You didn’t use a cake mix, you didn’t use canned fruit, you didn’t use boxed pudding… That amazing taste from the moist cake you made, came from your hands and your hands alone so I encourage you to try this. There might also be people like me that don’t stock their kitchens worth a darn… No powdered sugar, no pudding mix, nothing. It might seem like I’m a failure but you know, I came up with some things on my own. Just letting you know, you will have the insane need to brag on yourself if you make these recipes from scratch, but it’s okay, you deserve to if you didn’t use a cake mix! The example of a Poke Cake that I’ve seen is through my old boss (she was a caterer, which made me a catering assistant at the time) and would take a cake mix and bake it, then pokes holes in it. Either she’d add sweet condensed milk or a pudding to it and either cool whip or whipped cream. I think Pioneer Woman does the “Dump Cake” which is taking canned fruit, adding to the bottom of pan, pour cake mix over and add pieces of butter to it. Which really sounds like a crisp to me. (By the way, I have a great crisp recipe that I’ll share some other time, super simple and delicious) WARNING: I do have to warn you, from this point on, there will be about 3 recipes I’m listing and that’s not counting whipped cream. 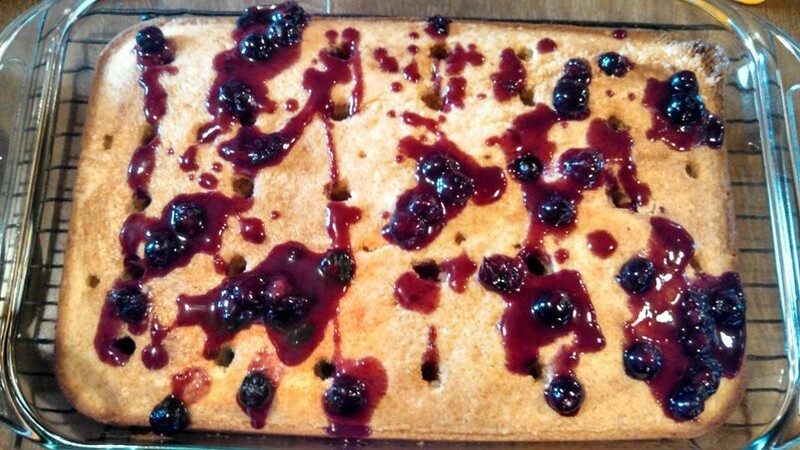 It will take a bit of time but if you do it right like, prepare you cake and get it in the oven then make your pudding and put in the fridge then make your blueberry sauce…. 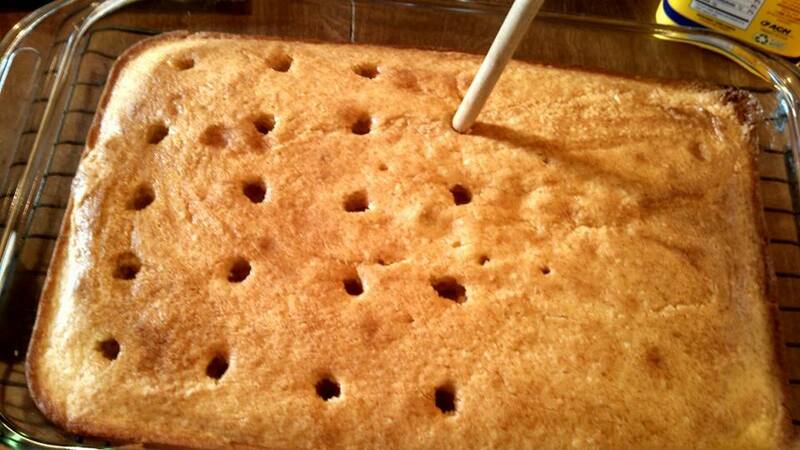 By then your cake should be done and you can start poking holes and add the your other recipes to it. 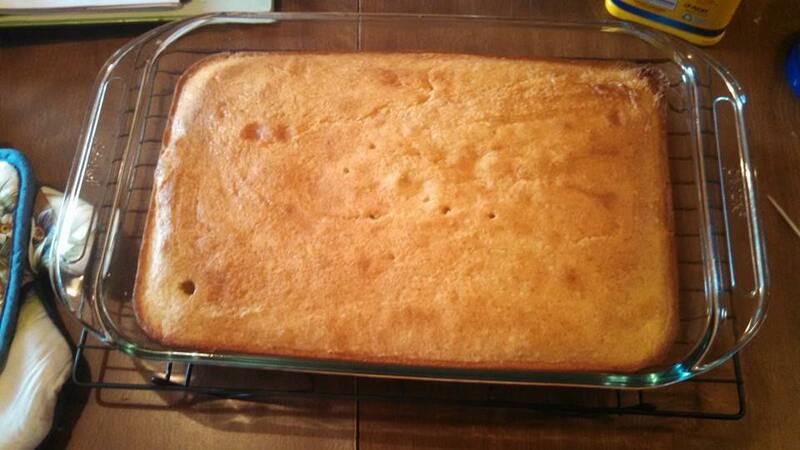 Cream butter and sugar until light and fluffy, add eggs one at a time, beat in vanilla. 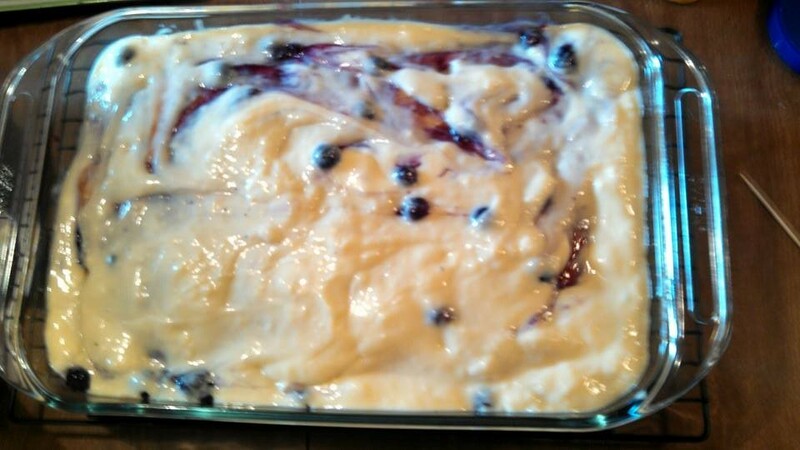 Combine the flour, baking powder, and salt and add to creamed mixture alternately with the milk. Beating well after each addition. Add egg mixture to saucepan. Bring to a gentle boil, reduce heat. Stir in butter and vanilla, pour pudding into a bowl. Cover surface with plastic wrap, put in fridge to cool. Combine sugar and cornstarch in a small saucepan. Stir in the water until smooth. 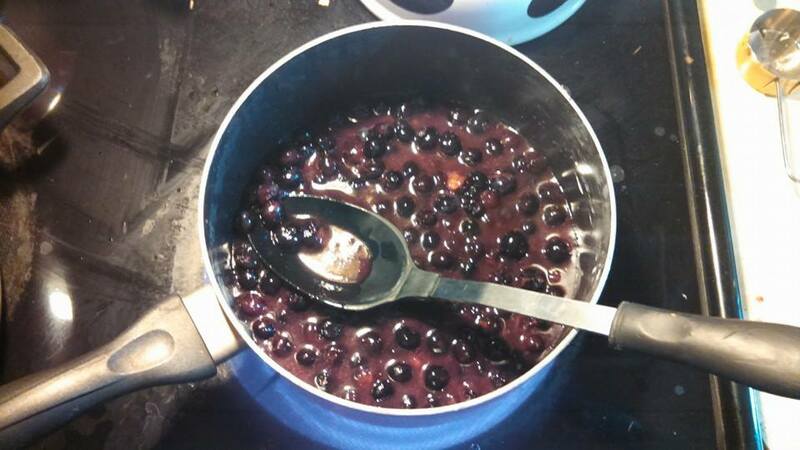 Add blueberries; bring to a boil over medium heat, stirring constantly. Cook and stir 1 minute longer or until thickened. The final touch which adds another flavor profile to the decadent cake is zest a lemon and orange, maybe about 1 tsp each and put it in the whipped cream. 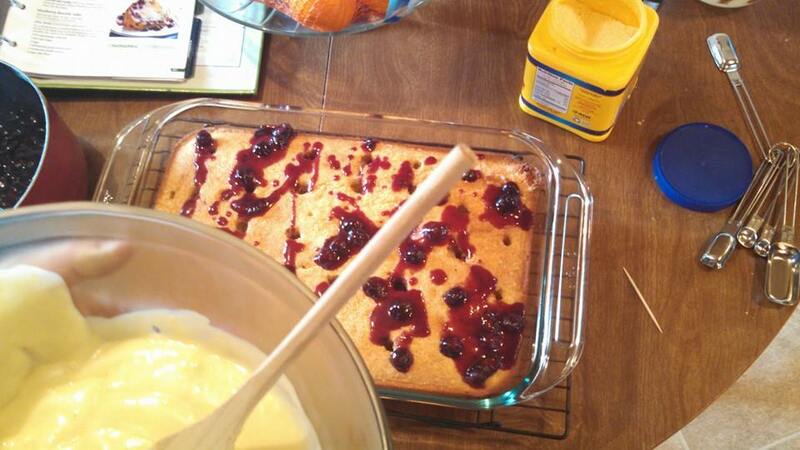 Put the whipped cream on the cake and then add the last of your blueberry sauce. AMAZING!!!!!!! Take a bite into heaven, don’t you agree? ?